On March 12, 2002, President Bush created the Homeland Security Advisory System (HSAS) by signing Homeland Security Presidential Directive 3. The HSAS is a five-tiered alert system designed to quickly notify government agencies, industry, and the public about terrorist threats to United States interests at home and abroad. The White House established the HSAS under the Attorney General's office in conjunction with the Office of Homeland Security, but the Department of Homeland Security (DHS) now controls the HSAS. The goal of this color-coded alert system is to increase effective communication and cooperation among the various federal, state, and local agencies that would be involved in the event of a terrorist attack and to make the public more aware of the threat of a terrorist attack. Before the establishment of the HSAS, numerous federal and local agencies utilized their own threat level assessments. These threat level assessments were used to notify specific agencies or sectors of government about possible attacks on American interests. The federal agencies that made such assessments did not readily disseminate this information to the American public or to state and local governments. Various agencies also acted on different intelligence reports, leading to disparate threat assessments. The HSAS provides a framework for these various alert systems. One of the most publicized components of the HSAS is its color-coded warning system. This system consists of five Threat Conditions, each accompanied with suggested Protective Measures. The five Threat Conditions are Low (Green), Guarded (Blue), Elevated (Yellow), High (Orange), and Severe (Red). The DHS and Attorney General devised the HSAS to provide an easy way for local governments and the public to assess the current situation and take appropriate action. 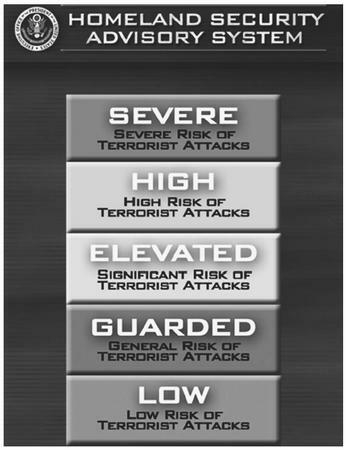 The five-level, color-coded terrorism warning system, enacted in 2002, is a response to public comments that broad terror alerts issued by the government raised alarm without providing useful guidance. surveillance, and implementation of local emergency response plans. The Department of Homeland Security defines the Low Condition (Green) as indicating a low risk of terrorist attacks. Under the Green level, government agencies and private industry should train personnel and analyze emergency plans. The Guarded Condition (Blue) indicates a general risk of terrorist attacks. Protective Measures dictate updating emergency procedures and keeping the public informed. The Elevated Condition (Yellow) signals a significant risk of terrorist attack. Under this condition, surveillance of sensitive locations is increased and emergency plans are readied and implemented, when necessary. The Department of Homeland Security declares a High Condition (Orange) when specific and collaborated information indicates a significant risk of terrorist attack. Under an Orange alert, security is tightened at high-profile public events, and the events are cancelled, if necessary. Access may also be restricted to sensitive areas, such as dams, nuclear power facilities, and government buildings. A Severe Condition (Red) signifies a severe risk of terrorist activity. A Red alert is only declared when there is a real and significant threat. Emergency personnel are reassigned as needed, transportation is closely monitored or redirected, and public facilities may be closed. Critics of the HSAS assert that the Threat Conditions system claim that the color-coded Threat Conditions may actually be detrimental to national security. These critics claim that the DHS holds the Threat Conditions at an artificially high level in order to give the appearance of preparedness and to avoid public outcry if a terrorist attack occurred at a low threat level. In addition, critics contend that leaving the color-coded warning at an artificially high level will erode public trust in the system. The Department of Homeland Security counters its critics by maintaining that elevating the Threat Condition when warranted deters terrorism by showing that America is vigilant. Additionally, an elevated Threat Condition alerts law enforcement to increase its efforts to combat terrorism. The Department of Homeland Security also has set criteria for raising or lowering the Threat Condition. The DHS weighs the credibility, specificity, and gravity of every piece of intelligence that is interpreted as a potential threat. The DHS, in conjunction with the FBI, CIA, and other agencies, then seeks to corroborate specific threats. Based on their findings, the DHS will then raise or lower the Threat Condition either for the entire nation or for a specific region. United States Department of Homeland Security. < http;//www.dhs.gov > (May 2003).